^ Keene, Allison. ‘Avengers: Infinity War:’ The Russo Brothers on Action, Tone, and Movies That Influenced the MCU Sequel. Collider. 2018-03-15 [2018-03-15]. （原始内容存档于2018-03-16）. ^ Avengers: Infinity War (2018). British Board of Film Classification. [2018-04-18]. （原始内容存档于2018年4月19日）. ^ Rian Johnson’s new Star Wars trilogy to film in Scotland » The Location Guide. www.thelocationguide.com. ^ Fritz, Ben. ‘Avengers: Infinity War’ on Track for Heroic Opening. 2018-04-19 –通过www.wsj.com. ^ Rubin, Rebecca. 'Avengers: Infinity War' Officially Lands Biggest Box Office Opening of All Time. Variety. 2018-04-30 [2018-05-14]. （原始内容存档于2018年5月14日）. ^ Avengers:Infinity War (2018). Box Office Mojo. [2018-04-30]. ^ 【復仇者聯盟3：無限之戰】官方前導預告 2018年 4月25日 末日降臨. YouTube上的MarvelTW頻道. 2017-11-29. ^ Keyes, Rob. ‘Guardians of the Galaxy 2′ Has Fewer Characters, One New. Screen Rant. 2015-06-03 [2015-06-04]. （原始内容存档于2015-06-04）. ^ Weintraub, Steve. Kevin Feige on ‘Avengers: Infinity War’, Spider-Man’s Future, 2019 & 2020 MCU Movies, and ‘Doctor Strange’. Collider.com（英语：Collider.com）. 2016-10-27 [2016-10-28]. （原始内容存档于2016-10-28）. ^ 12.0 12.1 Cabin, Chris. ‘Captain America: Civil War’ Directors on Landing Spider-Man, ‘Infinity War’ Shooting Schedule. Collider.com（英语：Collider.com）. 2016-01-14 [2016-01-14]. （原始内容存档于2016-01-14）. ^ Lovett, Jamie. Avengers: Infinity War Working Title Revealed. ComicBook.com. 2016-10-26 [2016-10-28]. （原始内容存档于2016-10-28）. ^ Donohoe, Graeme. New £400m Marvel blockbuster Avengers: Infinity War to be shot in Glasgow and Edinburgh. Daily Record（英语：Daily Record (Scotland)）. 2017-01-08 [2017-01-08]. （原始内容存档于2017-01-08）. ^ Romano, Nick. Avengers: Infinity War has wrapped filming. Entertainment Weekly. 2017-07-14 [2017-07-14]. （原始内容存档于2017-07-14）. ^ Burlingame, Russ. Avengers Composer Alan Silvestri To Return For Infinity War. Comicbook.com. 2016-06-06 [2016-06-06]. （原始内容存档于2016-06-07）. ^ Strom, Marc. Marvel's The Avengers Head Into an Infinity War. Marvel.com. 2014-10-28 [2014-10-28]. （原始内容存档于2014-10-29）. ^ Breznican, Anthony. Avengers: Infinity War release date moves up a week. Entertainment Weekly. 2018-03-01 [2018-03-01]. （原始内容存档于2018-03-01）. ^ Perry, Spencer. Avengers: Infinity War Blu-ray, 4K, and Digital-HD Details Confirmed!. ComingSoon.net. 2018-07-10 [2018-07-10]. （原始内容存档于2018-07-10）. ^ Avengers: Infinity War (2018). Rotten Tomatoes. [2018-12-17]. 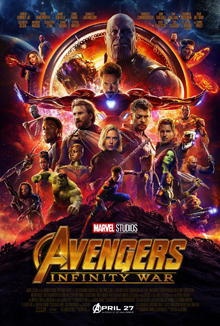 ^ Avengers: Infinity War reviews. Metacritic. CBS. [2018-04-30]. ^ D'Alessandro, Anthony. ‘Avengers: Infinity War’ Is Second-Fastest Pic To $400M With Second-Best Weekend Ever At $115M+. Deadline Hollywood. Penske Business Media. 2018-05-04 [2018-05-05]. ^ 1st 'Avengers: Infinity War' trailer debuts tomorrow on 'Good Morning America'. ABC News. 2017-11-28. ^ Couch, Aaron. Captain America's 'Infinity War' Beard Was Most Popular Part of Trailer. The Hollywood Reporter. 2017-11-30 [2017-11-30]. （原始内容存档于2017-11-30）. ^ Pallotta, Frank. 'Avengers: Infinity War' trailer assembles Marvel's mightiest heroes. CNN. 2018-03-16 [2018-03-17]. ^ 《复仇者联盟3》上海红毯现场粉丝夜排爆满 官博发声明被疯狂吐槽. cnbeta.com. 2018-04-19 [2018-04-25] （简体中文）. ^ 漫威10周年庆典惹争议：陈奕迅站中间 钢铁侠靠边站. 搜狐网，来源：华商网. 2018-04-21 [2018-04-25] （简体中文）. ^ 厦大一党支部书记辱华上热搜，竟还涉嫌论文抄袭，厦大和紫光阁回应了. 搜狐网. 2018-04-22 [2018-04-25] （简体中文）. ^ 作者：耿飏. 一线/迪士尼为漫威庆典再向粉丝道歉 承诺不再找中国代言人. 责任编辑：qinqinwang. 腾讯网. 2018-04-23 [2018-04-25] （简体中文）. ^ 《復仇者聯盟：終局之戰》首週團包加預售的票數為327,607張，是去年《無限之戰》109,147張的三倍。. Facebook. Marvel Studio Taiwan. 2019-04-15. ^ 35.0 35.1 洪文. 《復仇者聯盟3》全台首日5256萬 打破影史4項紀錄. ETtoday. 2018-04-26. ^ 36.0 36.1 全國電影票房2018年04/30-05/06統計資訊 (PDF). 國家電影中心. 2018-05-10. ^ 全國電影票房2018年05/07-05/13統計資訊 (PDF). 國家電影中心. 2018-05-17. ^ 全國電影票房2018年05/14-05/20統計資訊 (PDF). 國家電影中心. 2018-05-24. ^ 全國電影票房2018年10/01-10/07統計資訊 (PDF). 國家電影中心. 2018-10-11. ^ Truitt, Brian. It's finally here! Watch the first trailer for Marvel's newly titled 'Avengers: Endgame'. USA Today. 2018-12-07 [2018-12-07]. （原始内容存档于2018-12-07）. ^ Strom, Marc. Joe & Anthony Russo to Direct 2-Part Marvel's 'Avengers: Infinity War' Event. Marvel.com. 2015-04-07 [2015-04-07]. （原始内容存档于2015-04-07）. ^ Strom, Mark. Christopher Markus & Stephen McFeely to Write Marvel's 2-Part 'Avengers: Infinity War' Event. Marvel.com. 2015-05-07 [2015-05-07]. （原始内容存档于2015-05-08）.